If going to movies is your thing, signing up for Scene movie rewards is one of the best ways to get bang for your buck. This popular loyalty program has been around since 2007, and is the result of a partnership between Scotiabank and Cineplex theatres. The concept is simple. You earn points anytime you spend money on movies and snacks at Cineplex theatres. You also earn Scene points when you dine at a number of participating restaurants, such as Montana’s, Swiss Chalet and Harvey’s, just to name a few. Signing up for the Scene program is free, and you can start earning points right away. When you become a Scene Rewards member, you receive a card that can be used when you go to the movies, as well as for other perks. In addition, Scotiabank offers their own Scene credit and debit cards which allow you to collect Scene points. We’ll take a closer look at those a bit later. First, let’s review the regular rewards program. Upon becoming a Scene Rewards member, you instantly receive 250 points. From there, you continue to collect points as you make certain purchases. For example, movie tickets are worth 100 points. Purchasing premium tickets will earn you 150 points, and tickets a VIP Cinema garner 200 points. Purchase movies via DVD, Blu-Ray or digital movie download at Cineplex.com and you’ll get 5 extra points for each item. Purchasing movie tickets remotely: If you use either cineplex.com or the Cineplex app to complete your ticket purchase, you’ll earn 20 bonus points. Buying a Child movie ticket will get you an extra 50 points,, whether you make the purchase at the theatre or online. By choosing a snack combo at the concession stand, you can earn between 75 and 150 extra points. Partner restaurants: Earn Scene points when you dine at Swiss Chalet, Harvey’s, Montana’s, Milestones, East Side Mario’s, and more. As you can see, you can earn Scene points by simply following your normal spending patterns, But by making an effort to plan it out just a little bit, you could begin to accumulate points at a much faster pace. 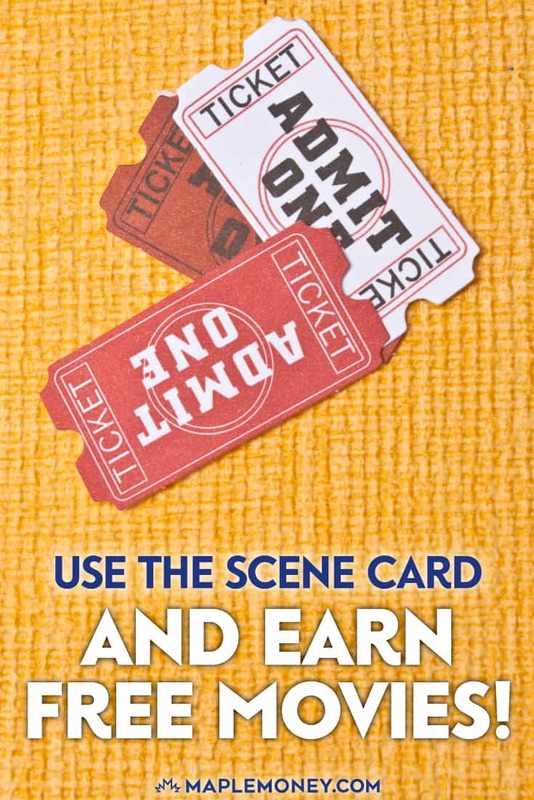 In addition to earning points, Scene members are eligible for some rather nice discounts, including 10% off of movie snacks, and mention a 10% discount off of Tuesday movie ticket prices. On top of that, there are a number of concerts and other events made available to members of the Scene program. Start earning your Scene points, and you can begin redeeming them for a number of cools perks. Again, signup is free; you can do it online, or at any Cineplex Theatre. Now, let’s look at some ways to enjoy those free perks sooner! Scotiabank has partnered with Cineplex to offer Scene branded debit and credit cards. These cards can help you supercharge your efforts to earn Scene points. If you use the Scotiabank Scene Debit Card, you will earn one Scene point for each $5 that you spend, no matter where you do your spending. This way, you can earn points whether you are grocery shopping or filling your gas tank. You can also earn points on certain purchases made in the United States. And if you use your Scotiabank debit card to at participating Cineplex Theatres, you’ll get 5 scene points on each dollar you spend. While I like to use my credit cards to earn rewards, then redeem them for cash back and free stuff, not everyone is comfortable with the idea of a credit card…even for rewards. If you want to earn rewards, but don’t want to use a credit card to do it, the Scotiabank Scene debit card is a great alternative. With the debit card, you benefit from holding an account with a trusted bank, and you don’t have to worry about using credit. Many people like using debit cards because they combine the convenience of a credit card with a chequing account. Paying with plastic is easier and more convenient than paying with cash, since you don’t have to carry around a lot of bills. Just swipe your debit card. (Or, if your Scotiabank debit card is equipped with Interac Flash, you can just tap or wave it against the terminal). With the Scotiabank Scene debit card, you don’t have to risk paying interest in order to earn rewards. The Scotiabank Scene debit card allows you to earn points on all of your purchases using the card. You receive one Scene point for each $5 that you spend making purchases with your debit card. If you spend money at participating Cineplex Entertainment theatres, you receive five Scene points for each dollar. This provides additional rewards over the regular Scene card, whether you are buying a movie ticket or buying concessions. On top of your ability to earn points in Canada, you can also earn points when you shop in the United States. Use your Scotiabank Scene card PIN at retailers with the NYCE logo, and you’ll earn points in the same way as you do in Canada. It’s a great way to continue earning debit rewards, even when you cross the border. Another option is to sign up for the Scene Visa Card from Scotiabank. In fact, if you make $500 of everyday purchases with the Scene Visa Card in the first three months, you’ll qualify for 2000 Scene points. And while the sign up bonus isn’t quite as lucrative as with the debit card, the Scene Visa card gives you 1 Scene point for every dollar you spend. This is better than the debit card, which requires $5 of spending to earn 1 Scene point. The credit card also earns you 5 points per dollar on purchases made at Cineplex. 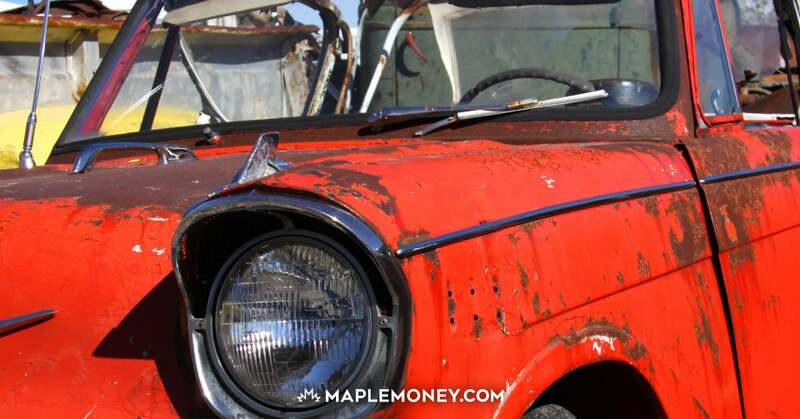 In addition to these added benefits, the credit card comes with no annual fee. Let’s take a more in-depth look that the benefits offered by the Scotiabank Scene Visa, given that it’s the most lucrative Scene Rewards program available. 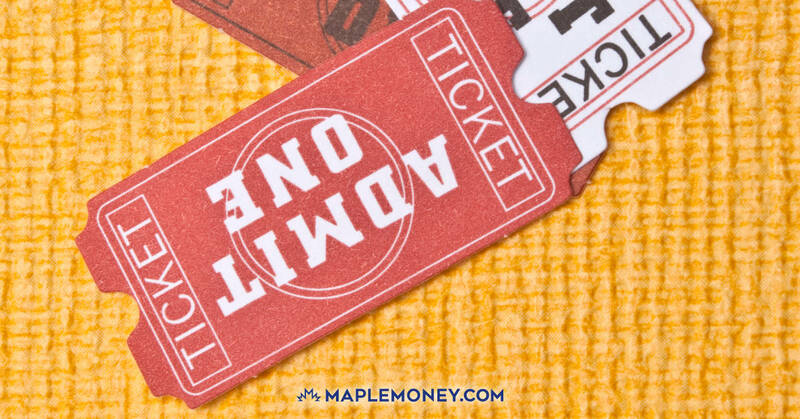 In order to take full advantage of this credit card program, you first need to be a member of the Scene program, which allows you to earn points at Cineplex Entertainment theatres. Remember, there is no charge for membership, which offers you the chance to earn free movies. One Scene point for each $1 you spend on your credit card. Five Scene points for every $1 spent using your Scotiabank Scene Visa card at participating Cineplex Entertainment theatres, or even online at cineplex.com. When you make your first purchase with the Scene credit card, you will receive 2,000 bonus points, provided you make $500 in everyday purchases within the first three months. The convenience of Visa payWave technology allows you to pay by waving your card in front of the terminal. With the Scotiabank Scene Visa, you can redeem your points for movies and music, as well as other entertainment options. Tickets to special events: These include WWE and the Met Opera Live starting at 1,200 points. Blu-rays, DVDs, and digital movie downloads and more as well. Dining rewards: Redeem your Scene points for e-Gift Cards that are good at Kelsey’s, Swiss Chalet, Milestones, and Montana’s. Special Events: Periodically, Scene will provide members with access to special contests for other rewards and entertainment opportunities. To redeem your rewards, you can show your Scene card at the movie theatre. You can also get a discount of 20% at participating AVIS car rentals around the world, allowing you to use your Scene credit card to enjoy travel as well as entertainment. The Scotiabank Scene Visa card has a 19.99% interest rate, which is fairly standard for a Canadian rewards credit card. There is a 22.99% rate on cash advances, which is also pretty standard. It’s important to find a rewards credit card that fits your lifestyle, so be sure to consider your preferences. But if you go to the movies often, this card can be a great way to get you there for free. Downloading the Scene Mobile App to your smartphone makes earning and managing Scene points more convenient than ever. Not only does the Scene App give you instant access to your Scene card so that you can earn points and Scene bonuses, but you can check your points balance and manage your Scene point history. Do you often attend movies with groups of friends? If so, you can earn Scene point bonuses by registering your friends through Scenetourage. Here, you can create groups of up to 10 people. When 2 or more members of the group attend a movie together, both will earn an additional 50 Scene points. Carrot Rewards links to several popular fitness step counters, and will reward you with free Scene points when you reach certain step goals. You can also answer quick surveys through Carrot Rewards, as another way of earning free Scene points. For full details, check out the Carrot Rewards website here. The coolest perk of the Scene program is the free movies you can earn. Free movies start at only 1,000 points. When you consider that you earn 250 points just to sign up for the program, you’re already a quarter of the way there. You don’t need to be a member of Scotiabank to sign up for Scene points and start using your Scene membership card. Anyone can sign up for free and start using the Scene card to earn and redeem points for free movies. It’s important to remember however, if you want to boost your ability to earn points, the Scene debit card or Scene credit card from Scotiabank will get you there faster. And if you love movies, isn’t that exactly what you want? I love this card and have been using it since they came out with it. There are a few additional ways to get points that you mentioned that I had never heard of so I will definitely take advantage of that now. Don’t think I would ever get the scene debit card just because I would end up living in a theater if that was the case. My buddy finally convinced me to get one of these cards. Seems like a no brainer really but I’m lazy! The best thing about Scene points is that you can use them for the VIP theaters as well. If you use your scene points to go to a VIP theater its 2000 points. Pretty good return if you ask me. Don’t forget to install the Cineplex app to your mobile phone. You can input your Scene account number to generate a barcode which you can show in paying your ticket. You don’t have to bring your card all the time. And if you forget the card just open the app and they can scan the barcode from your mobile phone. There’s no way to miss points. You can collect points faster. You can also collect Scene points using the Carrot Rewards app (for healthier living), free movies for meeting your daily step goals. Good value for use of points are the premium “films” of NT (National Theatre) Live and Metropolitain Live screenings.